Union Finance Minister Arun Jaitley, on 1st February, presented budget on the backdrop of demonetisation and GST implementation. Being the last full budget of the current Government before the next general elections in 2019, it was expected that the budget would be replete with populist announcements. Especially, the education sector was expecting a huge boost in terms of increase in education budget from 4% to 6% of the GDP. An outlay of Rs 85,010 crore was made by Union Finance Minister Arun Jaitley for the education sector for the next fiscal year. While Rs 35,010 crore have been allocated for higher education, an amount of Rs 50,000 crore has been earmarked for school education. This has increased from Rs 79,685.95 crore in 2017. The government has proposed a research fellowship scheme under which 1,000 best B.Tech students would be identified and given “a handsome fellowship” and facilities to do PhD in IITs and the Indian Institute of Science, Bangalore, in the hope that they would voluntarily commit a few hours every week to teach in higher educational institutions. This initiative would probably attract top ranked students from the premier central government institutions for pursuing PhD and eventually become faculty in Indian higher education. It’s a welcome step towards strengthening Indian Higher Education teaching & research. If implemented well, this may help India in improving its performance in global university rankings. The decision has been welcomed by the academic community overall, as such an initiative could help in fostering a culture of research and innovation in the field of technology. For decades India’s academic orientation has been skewed towards theory, with very little impetus on research and testing.The move comes in a time when India produces only 12,000 PhDs in engineering annually, unlike China, Britain and the US.. The government has also proposed setting up of two new full-fledged schools of planning and architecture and about 18 schools of planning and architecture to be set up under the Indian Institutes of Technology (IITs) and National Institutes of Technology (NITs) as autonomous schools. Looking at the rapid automation taking place in infrastructure and construction sector, this announcement looks untimely. However, this step could be aimed to cope with the demand for architectects and urban planning professionals for upcoming smart cities. To bridge the gap between doctor-patient ratio in the country, the finance minister proposed setting up of 24 new government medical colleges by upgrading existing district hospitals in the country. “The government aims to set up at least one medical college for three Parliamentary constituencies. Looking at the governance issues in the medical council of India and deteriorating conditions of government medical colleges and hospitals, government would be required to pay serious attention while setting up new medical colleges. In a major reform move for the higher education sector, the government has also announced a new model for funding infrastructure in the centrally-funded higher educational institutions, calling on IITs, NITs and IIMs to pitch in with 25% of total funds needed. The budget 2018 has declared that there will be no further grant-in-aid for new infrastructure across Centrally Funded Technical Institutes including the IITs, NITs and IIMs. It is estimated that Rs 1 lakh crore will be needed across institutes until 2021-22 for creation of new infrastructure. The move could be made to bring in greater accountability and responsibility in government funded educational institutes, to shift funding mechanism to a project based one rather than a dole out mechanism. The government also believes that besides pushing institutes to mobilise their own resources, the move will also allow institutes to seek more funds and money than they currently get allocated, provided their project proposal is credible enough. Under the new funding regime introduced today, each institute will now have to seek funds on the basis of projects proposals and seek loans from the Higher Education Financing Agency (HEFA) to fund the same. This change in funding mechanism may increase competitive environment among premier institutions however, for a country like India, the government funding in Higher Education Institutions should be based on more egalitarian view and mediocre institutions should not suffer due to most of the government fund allocation to top institutions. In case of Central Universities which have constraints in raising student fee, they will have to only pay 10% of the principal amount. Stopping short of fully deregulating fee in these institutes, keeping student interest in mind, the Modi government will allow educational institutes considerable freedom to mobilise resources on their own. While these initiatives are spearheaded towards creating an infrastructure to encourage skill development and ensure that our youth has relevant expertise in their area of specialization. 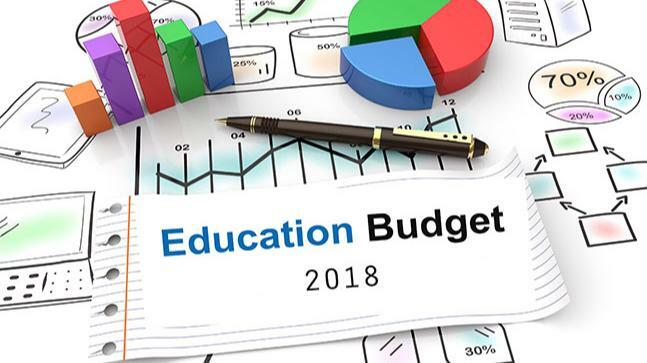 Broadly, education sector had the following expectations from this budget. While this year’s union budget almost managed to pacify all strata’s, but the people were still left wanting for more. For example even after much debate and discussion, topics like GST in Higher education or tax exemption under children education were not touched.. Therefore even with a slew of such initiatives, one could only come to a conclusion basis what gets translated into ground reality and in what amount of stipulated time.